First, there was Aretha Franklin, then there were the Clark Sisters, and then there was LeAndria Johnson.” This statement of high praise is only one of many made by gospel music’s greatest during Season 3 of BET’s Sunday Best, the world’s leading gospel competition show. Le’Andria Johnson championed over thousands of hopefuls who auditioned for the show nationwide and abroad. After an arduous journey, Le’Andria Johnson was crowned Sunday Best by garnering more than 2 million votes. While this single mother’s heart-wrenching story of losing her home tugged at the heartstrings of the viewing audience, it was her voice that captured the hearts of the Sunday Best host and judges, gospel music’s best: Kirk Franklin, Kim Burrell, Donnie McClurkin, Yolanda Adams, and Mary Mary. 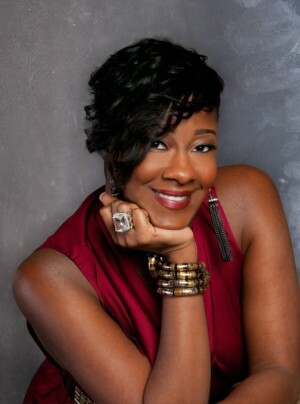 Many know LeAndria Johnson as the Season 3 winner of Sunday Best, but she is also an accomplished songwriter & producer, an anointed praise & worship leader, and part of a family of talented, self-taught musicians. She began singing at the age of 2 in her hometown church in Florida and has continued worshiping the Lord with her voice ever since. She is truly a God chaser and world changer who is leaping into her destiny. Le’Andria Johnson, the 28-year-old Florida native, currently resides in Orlando with her three children.